​In today's world it is practically impossible to find an oasis of silence: noise pollution invades everything and it is necessary to recognize it in our interior. In Eastern cultures, they are much more aware of this need and practice assiduously the inward gaze and the absolute stillness. They know silence allows the mind stillness and the discovery of the essence which shapes us. The roots of this tradition have their origin in Buddhism. Legend has it that one afternoon Buddha, stopped his sermon, held a flower between his fingers and remained silent. The disciples expected a sermon full of content, but instead received a silent message; a simple flower in the teacher's hands. All the disciples were displeased, except Mahakasyapa, who sketched a simple smile before the flower and understood the message, thus becoming the first successor of the lineage. That day, Zen Buddhism was born. 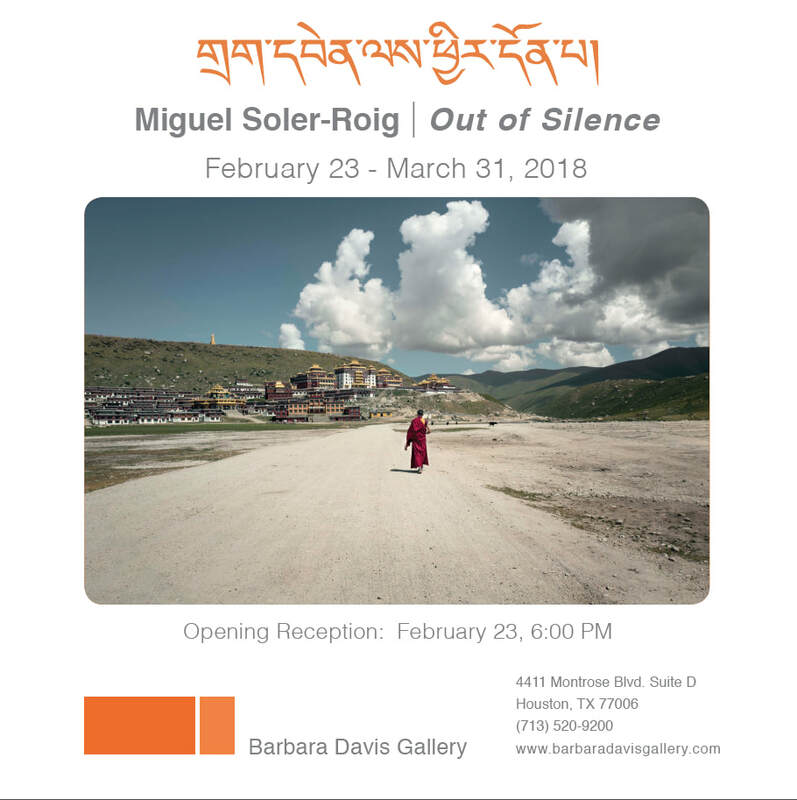 In his last series, Miguel Soler-Roig travels to one of the most inaccessible regions of Tibet to hear the first words of a monk who, aware of this teaching, maintained for three years a voluntary vow of silence. The artist accompanies him in his daily wanderings, sharing a spiritual life that manifests itself in each small action and in the way of relating to the world. The key symbols of the photographs culminate in an overwhelming way in the videographic artwork. A curtain of smoke gives way to the chants of the lama singing his first words in a mantra. The transition from darkness to light is equated with the experimentation of the Bardos or intermediate states: the first one or Chikhai Bardo. This phase is what happens at the moment of death, when consciousness withdraws from the senses; one no longer hears or sees anything, everything becomes blurred until it vanishes. There are no tactile, olfactory sensations or flavours to perceive. Finally, the breathing stops. The last long breath is inhaled and then exhaled at the last gasp; there is a long silence and no more breathing after that. Dissociated from the body, the mind is freed from all the things that imprisoned it, its passions and attachments, its satisfactions and dislikes. At that moment, suddenly and fleetingly, reality itself is experienced as a light fading away - what Buddhists call the Dharmakaya. For a moment, the sensation is of lightness, of weightlessness. When facing the tunnel of death, the individual merges with the luminosity, from which it becomes a part. The video shows the continuous cycle that originates and extinguishes at this point through a process of teaching and learning in which the monk enters into communion with nature, involving the viewer. The parchment that accompanies it constitutes his first testimony after having been purified in the doctrine of silence. The spontaneity and freshness of its most immediate inspiration reflected on paper. Silence is very powerful, you can say many things without articulating a word. The nature of silence is calm, which in turn implies solidity, like a mountain. However, stillness can also be invoked through movement, like performing a physical journey leading to mental recollection. This is the meaning of the meditation labyrinth transferred to the gallery and revealed to the visitor. Miguel Soler-Roig proposes an experience of introversion to feel peace of mind and imbue in the deep mysticism of the exhibition. The light of a flame comes on. The silence breaks. The decisive moment. A bowl emits a sound in continuous movement of slowness. The great awareness of time. It is the inner voice that seeks the origin at the end of the infinite consciousness. Through practices that open and raise consciousness we can experience life and spirit. The "fog-remover" Guru removes the darkness. The duration of life is like a flash of lightning in the sky, like a torrent down the mountain. The branches of a tree. A fabric to the wind. A backlight in the window. Fear limits us to flee from panic to death and accept change. From darkness to the light of liberation. Fear is ignorance of the unknown. It is the understanding of fear that makes us no longer afraid. This is the reason we must overcome it by being aware in knowledge, for the definitive moment arrived, to feel freedom. We are born to learn to die and we have the opportunity in the last breath of our life, if we are fully aware and have prepared well for it, to be able to take that consciousness with us and move towards the new life. From silence to the sound of light. Referring to the description that John Szarkowski describes in "The Eye of the Photographer", talking about the photograph of Henri Cartier Bresson and his decisive moment; "What happens at the decisive moment is not a dramatic but visual climax. The result is not a story, it is an image. " The decisive moment or inspired moment, as we might call it, is when the photographer's eye, heart and mind are aligned and are all present in a photograph. Basically it is when the whole universe traces a moment in which everything is aligned: Composition, Emotion and Thought. It is as if everything were reduced to a small moment in which life slows down in order to capture it in a single image.